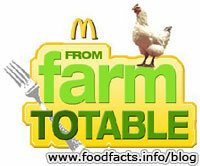 McDonald's "Farm to Table" web presentation appears to be what image conscious McDonald's executives must view as a rebuttal to fast food production claims made in Eric Schlosser's Fast Food Nation. The animated "Farm to Table" presentation is 'hosted' by Vonetta Flowers, Gold Medal winner in Women's Bobsled, in the 2002 Olympics. The site's goal is to illustrate the wholesome path taken from farm to table by the foods that make up some of McDonald's menu items. Included are the Egg McMuffin, orange juice, Cheeseburger, French Fries, Coca-Cola, and their Asian Salad. I have to say that the discussions of each of the menu items are (mostly) quite appetizing. You're left with a sense of wholesomeness, quality and, well, hunger. And that's the point. There are numerous aspects of the farm to table trip that are absent, but after all it is basically just corporate PR, we can't really expect them to illuminate the 'dark underbelly' can we? Speaking of belly, during the presentation on the production of the McDonald's cheeseburger you're introduced to Foster (left); he's the official bun taster at the plant that produces 60,000 buns per hour. I think the carbs are getting to him!